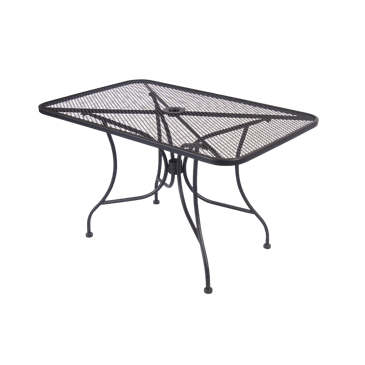 The Wrought iron table heavy duty construction with a powder coated rust resistant finish. Tops are netted and include hole in the center to accommodate umbrella poles. This item ships un assembled (simple assembly is required). Available in different sizes—24”X24”; 30” Round, 30”X30”; 36”Round; 36”X36”; and 30”X48”.